Haemodialysis treatment is needed when a person’s kidneys stop working and are therefore no longer able get rid of toxins and excess fluid in the body. Without treatment they will pass away. Haemodialysis treatment is required three times a week for around 5 hours each session. For people who live in communities where treatment is not available, being diagnosed with kidney failure means moving in to town and having limited opportunities to safely return home. 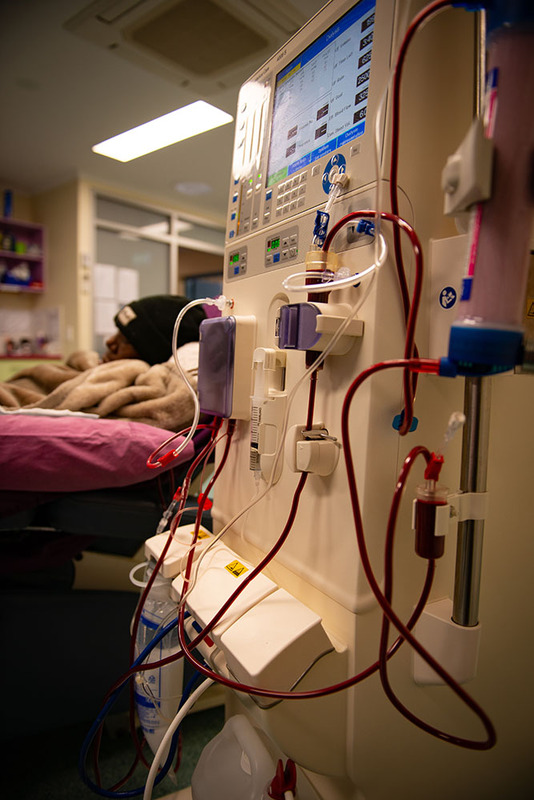 We provide dialysis patients from remote communities respite from mainstream dialysis centres, treatment on community enabling people to get back to country and family and provide support for people who want to learn self-care dialysis. Purple House provides haemodialysis in 14 locations and via our mobile unit the Purple Truck. For people who are struggling to attend their dialysis, take their tablets or stick to their fluid restrictions, spending some time dialysing at the Purple House where they feel comfortable may help. Having the opportunity to spend time back at home also encourages people to look after themselves and stay well!